N THE BEGINNING they destroyed Egypt’s air force on the ground and knocked out the planes of Jordan, Iraq and Syria. That was Monday. Then they broke Egypt’s massive defences in Sinai. That was Tuesday. Next, they took the old city of Jerusalem and prayed. That was Wednesday. Then they reached the Suez Canal. That was Thursday. They ascended the Golan Heights. That was Friday. Then they took the peaks overlooking the plain of Damascus. In the evening the world declared a ceasefire. That was Saturday. And on the seventh day the soldiers of Israel rested. This is a year of big anniversaries in Israel: 120 years since the First Zionist Congress in Basel; 100 years since the Balfour Declaration promised the Jews a national home; and 70 years since the UN proposed to partition Palestine into a Jewish and an Arab state. But the commemoration of the half-century since the six-day war will be the most intense. This special report will examine the legacy of that conflict. The territories that Israel captured are the defining issue of its politics and its relations with the world; they are also at the heart of Palestinian dreams of independence. The six-day war was the last unalloyed military victory for Israel, and the start of a transition from existential wars against Arab states, which it always won, to enervating campaigns against non-state militias which it could never wipe out. The threat of invasion across its borders has vanished, but the violence within them is unceasing. In 1967 Western arms decisively beat Soviet ones. As America allied itself firmly with Israel, cold-war divisions overlaid the Arab-Israeli conflict. And when Charles de Gaulle switched sides to align France with the Arabs in 1968, in effect banning weapons sales to Israel (notably of Mirage jets), he unwittingly laid the foundation for Israel’s flourishing high-tech industry. These days it is France that buys drones from Israel. The embattled refuge for the Jews became a mini-empire, ruling over millions of Palestinians. It was, in many ways, an improvised conquest, “The Accidental Empire” (the title of a book by Gershom Gorenberg), but one which has endured. The war awakened Palestinian irredentism and Israeli zealotry, and added the intractable power of religion to the forces of nationalism. The wall that divided Jerusalem has gone, but Israel has erected many more barriers that atomise Palestinian society. Israelis have grown rich, which makes the misery of Palestinians all the more disturbing. In uniting the ancient land of Israel, the victory has divided Israel’s people and coarsened its democracy. That heady June day in 1967 when Levi Eshkol, then Israel’s prime minister, heard news of the capture of Jerusalem, he told party colleagues: “We’ve been given a good dowry, but it comes with a bride we don’t like.” His words proved more prescient than he imagined. Old Israeli soldiers still tell their stories of the war day by day, hill by hill. Reuven Gal was a platoon commander in the Jerusalem Brigade, a unit of reservists from the city who fought within earshot of their homes. After a battle to control the UN headquarters the previous day, Mr Gal recalls advancing at dawn on June 7th towards Jordanian trenches on the hill of Jebel Abu Ghneim. To his relief the position had been abandoned. As his men rested, he heard the radio signal from Motta Gur, commander of the paratroopers who had entered the walled city: “Har habayit beyadeinu” (the Temple Mount is in our hands). All around him, hardened soldiers wept at the news. Palestinians, for their part, talk of their dismay at how Jordanian troops gave up Jerusalem’s Old City with barely a fight, and of their surprise at discovering that the armoured vehicles rumbling into the city were not Iraqi reinforcements but Israeli. On the edge of the Jewish Quarter of the walled city, Abu Munir al-Mughrabi lives in a small one-bedroom flat that is a makeshift museum to the loss of Arab Jerusalem. On his wall of pictures of the city, one shows him as a 25-year-old in a suit, standing amid the rubble of his neighbourhood, the Mughrabi Quarter. It was demolished by Israel immediately after the capture of the Old City, turning the alleyway in front of the Western Wall, the most important place of Jewish prayer, into the wide plaza it is today. He holds up his hand-drawn map of the vanished buildings and a list of the 138 families that were cleared out. Abu Munir had been in Amman when the war broke out. He slipped back across the border to reach Jerusalem just as his home was being torn down. For a time he smuggled people to and from Jordan. He also smuggled weapons for Fatah, then a rising militant movement, and spent time in jail. There were also some unexpected benefits: Palestinians from the West Bank, which had been annexed by Jordan, renewed ties with Palestinians from Haifa and Jaffa, which had been part of Israel after 1948; and from Gaza, which had been occupied by Egypt. “The Palestinian national feeling re-emerged because of the occupation,” says Mr Jarbawi. That sentiment burst forth with the first Palestinian intifada, or “shaking off”, in 1987. Until then the Palestinians under Israeli rule had remained mostly placid, while the Palestine Liberation Organisation (PLO), dedicated to the removal of Israel by force, conducted cross-border attacks from abroad. The armed struggle was, for the most part, a failure. The PLO lost a civil war against King Hussein of Jordan in 1970; embarked on a campaign of international terrorism, including the massacre of Israeli athletes at the Munich Olympics of 1972; helped to precipitate the civil war in Lebanon in 1975; and was evicted to Tunis after Israel’s invasion of 1982. By contrast, the intifada was marked mainly by stone-throwing clashes. It dashed the illusion that Israel could hold on to the occupied territories at little cost. The Oslo accords of 1993 established an autonomous Palestinian Authority under Yasser Arafat, the PLO leader, who returned triumphantly in July 1994. Extremists on both sides set out to destroy the deal with unprecedented violence. A Jewish settler killed 29 Palestinians at prayer in Hebron in 1994. Hamas and Islamic Jihad, both Islamist factions, embarked on a campaign of suicide-bombings. In 1995 a right-wing Jew murdered the prime minister, Yitzhak Rabin. The second intifada, precipitated by the failure of peace talks at Camp David in 2000, involved guns and bombs. Mr Arafat often seemed to tolerate, or even encourage, the militants. Unilateral Israeli withdrawals from Lebanon in 2000, and from Gaza in 2005 (after Arafat’s death), did not bring peace either: Israel fought repeated wars against Hamas and Hizbullah (a Lebanese Shia militia), both of which fired numerous rockets at Israel. For most Palestinians, the Oslo deal brought a worse occupation: more bloodshed, internal division, loss of land to settlers and territorial fragmentation. Palestinians these days live as refugees in the Arab world; in an open prison in the Gaza Strip run by Hamas; in a patchwork of isolated autonomous enclaves in the West Bank run by the nationalist Fatah faction; as neglected “residents” of Israel in Jerusalem; and as second-class citizens struggling for equality in Israel’s pre-1967 borders. The chaos in the Middle East since the Arab uprisings of 2011 has hardened Israel’s conviction that it is too risky to give up more land: what if Hamas or Islamic State (IS) took over the hills of the West Bank overlooking Israel’s most populated areas? Israel came close to returning the Golan Heights in peace talks with Syria. Now that militias such as Hizbullah, al-Qaeda and IS have implanted themselves on the frontier, many Israelis are grateful that the negotiations failed. For their part, the Palestinian feel their cause has been forsaken by Arabs that once held it dear. Pollsters say that opposition to the idea of peace based on the creation of a Palestinian state alongside Israel is strongest among the young of both sides, those aged 18-24. Their parents may have known a time with no internal barriers and cordial if unequal relations between Arabs and Jews. These days most young Israelis and Palestinians have little contact. Life in Israel, safe behind the security wall and the mental one that says “there is no partner for peace”, is more comfortable than it has been for most of the country’s short life. Security has improved, for now. The economy is booming. And even as its politics turns more chauvinistic, its society is opening up in other ways. 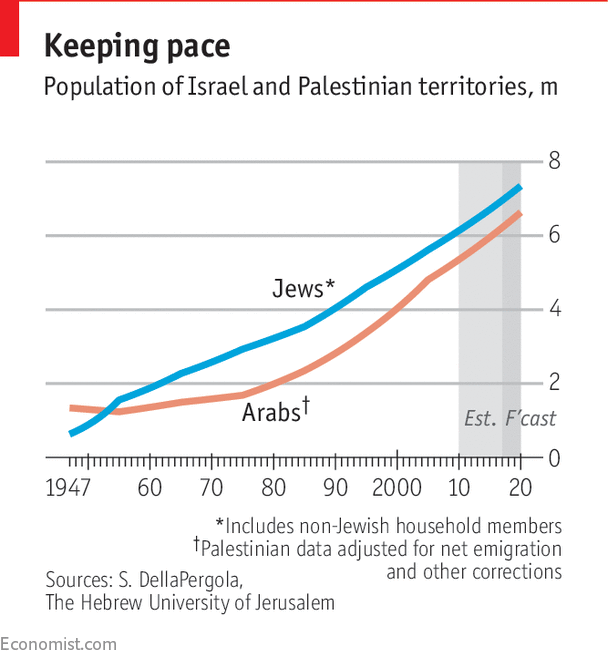 Arab citizens of Israel, who lived under martial law until 1966, are becoming more integrated economically. In Jerusalem, some Jews and Arabs challenge each other at backgammon and dance the Palestinian dabke. Israeli music is rediscovering the rhythms and tones of the Orient. The army welcomes women and gays, despite objections by some rabbis. The old conflicts over sabbath observance are, for the most part, a thing of the past. Even in Jerusalem, islands of secularism have emerged. Visit the beaches or the pulsating bars of Tel Aviv, eating non-kosher Thai prawns, discussing the latest algorithm and watching the handsome youth drift by, and you might imagine yourself in California. Fifty years after 1967, it has become too easy for Israel to forget that, just a short drive away, the grinding occupation of Palestinians has become all but permanent. Be the first to comment on "Israel still occupies Palestinian land 50 years after its six-day war"